There are 2 ferry routes operating between Formentera and Ibiza offering you combined total of 92 sailings per day. Balearia operates 1 route, Formentera to Ibiza which runs 33 times daily. Trasmapi operates 1 route, Formentera to Ibiza which runs 27 times daily. Aquabus operates 2 routes, Formentera to Ibiza runs 6 times per day & Formentera to Playa d'en Bossa (Ibiza) about 14 times weekly. Mediterranea Pitiusa operates 1 route, Formentera to Ibiza which runs 24 times daily. As the frequency and duration of crossings on some routes varies we would advise that you do a live search for crossings from Formentera to Ibiza to get the most up to date information. 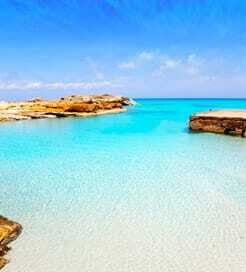 Formentera is the smaller and more southerly of the Balearic Islands of Spain. With a population of only seven thousand and no airport, Formentera is usually quieter than its sister island Ibiza, though like most Mediterranean islands, large amounts of visitors arrive during the peak season of July and August. Formentera is known for its pristine white sand beaches and crystal clear water, and is perfect for those looking for a relaxing break of sun and sand. In terms of travelling from Formentera by ferry, Ibiza, just six kilometres to the north is where the majority of ferries travel to with sailings running year round and up to every thirty minutes during peak times. You can however also sail to mainland Spain, port of Denia which takes around three hours. The Formentera Denia crossing is seasonal and general runs between May and October. For those who want to travel to mainland Spain out of season you can pick up a connection from Ibiza.